. . . Still, this is one of the best couple books I've reviewed on this site. I originally read this as a library book, but I'll be ordering both a copy of this one for my library and a copy of Madden's first book as well. Not recommended for getting a sense of the modern game, but enthusiastically recommended for fans looking for an enjoyable book written by an expert and who can stand the dated factor. Tom over at RP is the guy that turned me on tho this site. You can thank or blame him for that. 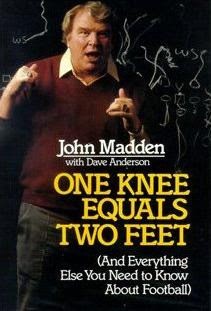 Madden had a game plan to his broadcast style as well. He really loves the game and those who play and coach it.